It’s the year 2001, my senior year in university. As a “kezban”  who has just begun to know his identity, I frequently go to Kaos GL. In one of these visits, I overhear a discussion on whether to join May Day demonstrations as Kaos GL. When they ask me “will you come as well?”, I cannot say yes straight away. But eventually I did. 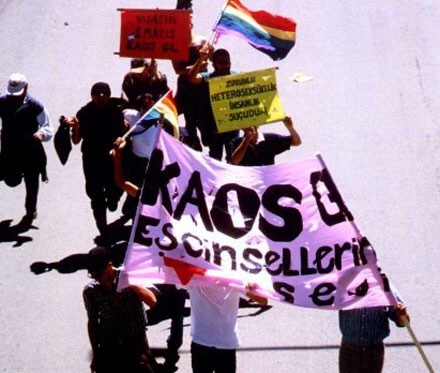 There were approximately 15 of us, with our banners, manifestos, hats, and sunglasses, in front of everyone else, walking from Sıhhiye Square to Tandoğan Square, with a banner that read “KAOS GL THE VOICE OF THE HOMOSEXUALS”. Some people were crumpling up and throwing the manifestos I was handing out, others were shaking hands with me and congratulating us… the media constantly pressing a microphone to our noses and trying to get footage… Pride, sadness, excitement, fear, anxiety, hope—every emotion at once. My first march for the struggle for our rights as a gay man took place in such an atmosphere, among thousands of emotions and only 15 people. Being a part of the march at that moment has been the source of a special pride for me. Years passed and LGBTI individuals have become more visible in every sphere. They have become relatively more “accepted” by society, compared to the past. The marches that only 10-15 people participated in 15 years ago draw crowds in the tens of thousands today. In one aspect, the last 10 years has created a “false spring” for LGBT rights and the Pride March. The amazing participation and enthusiasm at Pride Marches in 2013 and 2014 were the last blossoms of this false spring. In 2015, we saw that we were only just embarking on this path. It occurred to us that we have to work much harder to have a Pride March like the ones we see taking place in Western society. Or rather, it occurred to us that one needs to earn a Pride March that is fun, enthusiastic, proud, and exempt from verbal or physical violence. For Pride 2015, at around 3 p.m. in Taksim, we decided to join the march after drinking a couple of beers in a cafe with five to six friends. As we drank our beers we were having güllüm , hoping to go to the march as soon as possible, then news started flowing in from our social media feeds. And then came the unmistakable smell of that damn gas in air. It wasn’t the time to sit in a cafe anymore. It was time to go out on the street, march, and resist. Two of us went outside. As we approached the German Hospital, we ran into a water cannon coming from Taksim. The water was forcing us towards Cihangir square, sweeping us as if we were trash. A few protests slogans and water blasts later, we were making our way to Cihangir, when I saw the police standing across the street. I heard something clanging against the metal barriers behind me. As I tried to figure out what was going on, a plastic bullet hit me in the arm and another one in my neck. The police had no conscience, no mercy. They didn’t care if the bullet hit me in the eye or anything. Eventually they managed to pen us inside Cihangir square. We carried on with our demonstration and chanted our slogans despite being pushed to the margins, as only a few hundred people. Thinking back now, I remember tens of thousands in the cafes around the square that day. But there were only a hundred maybe, resisting, demanding their rights and paying the price when the police did not allow us to march. I don’t blame anyone. But if we want to walk proudly, we have to struggle for it and to earn what is owed to us. No one will hand it to us on a silver platter. We will resist and we will get it, as it has always been in history. Hoping that we will have for more free Pride Marches. “Kezban” is a slang word for an inexperienced person. In Turkish LGBTI slang “lubunca”, “güllüm” means fun, pastime, entertainment.